INCREASE YOUR PATRONAGE AND INCREASE YOUR PROFITS! A simple system with amazing results! We understand that it’s hard to find the time to effectively market your business. Try as you may, you just can’t seem to get a regular pattern going. You try your best, but the demands on your time are just too great. It’s not your fault; it’s just the way it is. I bet you’ve been bombarded with all sorts of advertising techniques and publications, probably to the point where you’ve thrown your hands in the air and given up. You aren’t alone. But remember one thing; most of your competitors are in the same boat. So why don’t you change boats? Most of your advertising and marketing is taking the shotgun approach. You place an ad in a paper, print some flyers for mailboxes etc etc, everyone does that. But, what most of your competitors don’t do is capitalise on their most valuable asset; their current customers! * It costs 7 times more to acquire a new customer than to retain an existing one. * Repeat customers spend 33% more than new customers. * 80% of future profits come from 20% of existing customers. * A 5% increase in customer retention can lead to a 25% increase in profits. Here’s how it works. 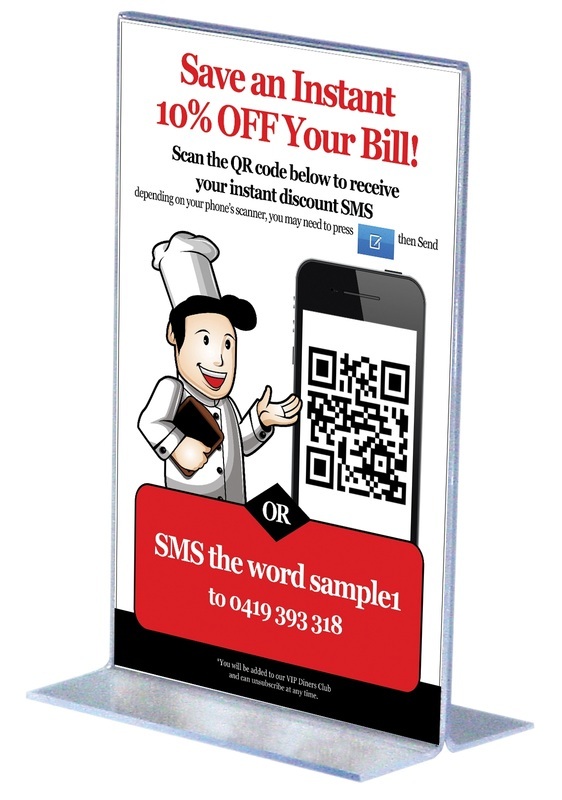 You offer your customers a small discount if they scan a barcode with their phone, or SMS a word to a special number. They get a response SMS which they show to your cashier to claim the discount. Their phone number is automatically added to your “V.I.P. Diners List”. We send that list SMS messages with special offers, invitations to events, “refer a friend” campaigns, etc. etc. on your behalf. In short, we encourage your current customers to visit you more regularly. We also encourage them to get their family and friends to become customers as well. You decide the discount rate (5%, 10% etc). You decide if a phone number can be used more than once to get a discount. You decide whether one discount SMS covers the whole table, or only that individual. (If you make it only that individual, everyone at the table will send you an SMS, an even better result for you). The signs can be on every table, or taken to a table with the bill, or be near your cash register. It’s simple and extremely effective.